The past year has provided us with great movies in which we enjoyed very, and Star Wars Episode VII contributed to the 2015 really be remembered for the movies. However, 2016 looks set to be even more successful. 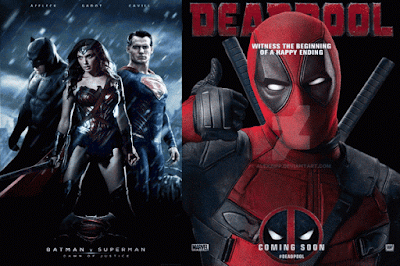 This year, everything will revolve around superheroes, as might be expected. Shafts popular movies and shiny new titles will make this year very interesting. Also, very interested to know whether this year DC manage to get closer to Marvel. Tarzan the ape man finally gets a remake. This year we will have the opportunity to see Tarzan in an epic battle and the story of what we have not seen nor heard. Crazy action in the jungle, excellent cast and the amazing visual effects will contribute to this movie really be special. Another sequel X-Men saga will be on cinema screens this year. Looks like it will be so far the most exciting X Men movie which will be full of various characters. And this time, we expect new and young cast, so the older heroes like Wolverine and Cyclops be thrown into the background. Those who have enjoyed the first film "Independence Day" will be able to see the continuation of this legendary film. Unfortunately, Will Smith, who was the main protagonist of the first film will now not play. He was too busy with the filming of "Suicide Squad" and was not able to appear in the sequel of this film. In any case, we expect the "Independence Day" to be a great movie that brings us this time a little darker story. The most popular villains from the DC universe in one place. Yes, that's Suicide Squad, a team composed only of villains. Along with popular characters like Deadshot and Harley Queen, in this film we have a chance to see the new Joker played by Jared Leto. We all know the popular "Jungle Book". This year we will have a chance to see Mowgli in the unprecedented adventure. Popular story being told once again, but in a modern and exciting way. Of course, the good old panther Bagira and good-natured bear Balu will also be in the film. One of the most popular and greatest video games of all time gets its film adaptation. Fearless Assassins fight against powerful Templar order to prevent them to conquer the world. If the film is similar to the game, we are confident that it will be a masterpiece. The film, which is so long waited, finally arrives in theaters. Yes, it's "Superman vs. Batman" and this will be a combination of the two biggest heroic legends. Henry Cavill we've seen in the role of Superman, but we can not wait to see how Ben Affleck will present the role of the dark knight. When we mention Marvel, we find it hard to not excited. Soon arrive a new sequel titled "Civil War". Although Captain America will be in the foreground of the film, the other Marvel heroes will also appear. Captain America and Iron man will confront this time, we can not wait to see how the fight of two super-hero look. In this film we will have the opportunity to for a few moments see the new Spiderman who will in 2017 get new movie. Another game gets its own film. Since the poster for the film "Warcraft" began to dominate the internet, fans and lovers of this saga literally "go crazy". In the film we see the incredible visual effects, great battles and incredible characters that will contribute to this really be a superb movie. At the first place we had to put Deadpool. This anti-hero finally got his film after many years of delay. Ryan Reynolds, who plays the lead role, with huge efforts has managed to convince the producers that this project becomes a reality. Deadpool will be a new addition to the Marvel universe.